A post here tonight to help carry out the Mission that NWPR started 12 years ago! We have always stressed being ONE FAMILY – One NW High School Football Family. I have always worked to build our brand- to tell the story of the quality of players we have. As one of the pioneers in the blogosphere and prep analyst world, I take great pride in where we were (a place coaches and big schools avoided) and where we are now (a recruiting hotbed). We made it and we did it together. Along the way, I was allowed to nominate and vote for at least 15 Army All Americans from Oregon, Washington, and Idaho. 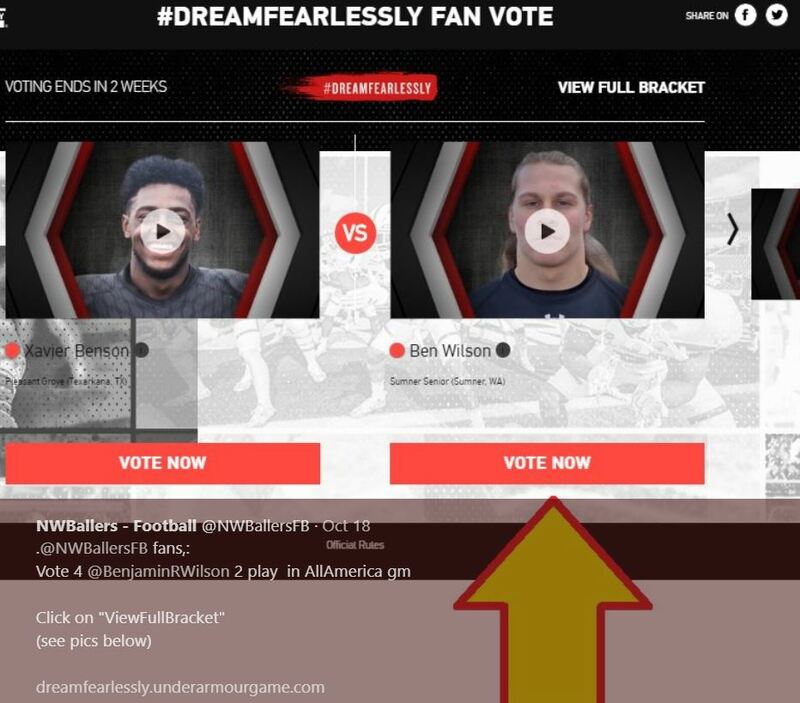 In addition, we were also able to influence the voting for the Under Armour All American Game. Now I contribute nominations and coverage for the Polynesian Bowl – Hall of Fame Game and it is on the rise. These 3 games are big time- the biggest of platforms for High School recruits and they are watched by college coaches and boosters from all over the globe. The appearance of our boys in these Having just wrapped up 7,000 articles and posts it has been my great privilege to get to know so many of you. We have seen more and more voices rise up out of the NW and together it has been a great run! To keep recruiting moving upwards we need to keep putting our best of the NW out to the best games in the world. Tonight and over the next few weeks, you have a chance to do that with the simple click of a button! 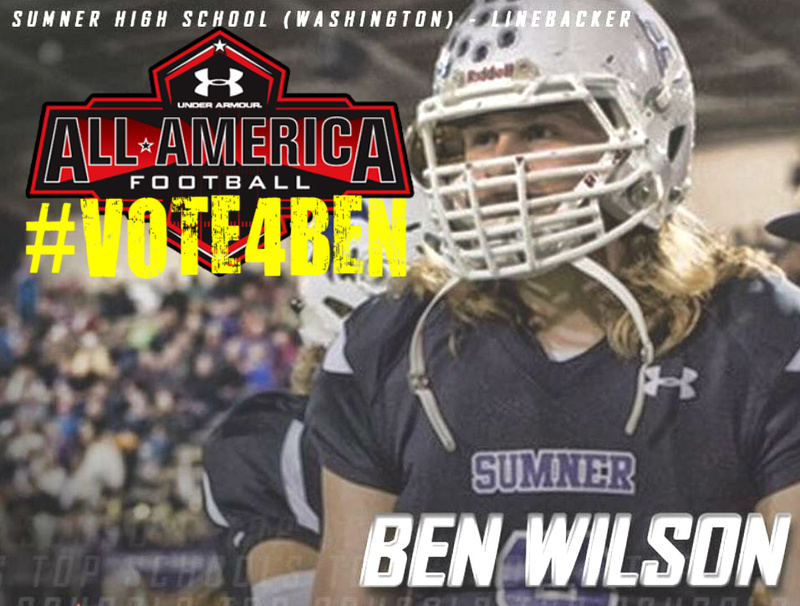 Sumner High School (WA) Senior Linebacker Ben Wilson is a Semi-finalist for the Under Armour All American Game. This young man has all the attributes that typify the NW Prep Football brand. He is tough, smart, fast, and a tremendous football player. He, like many of you and your players, is one of the best in the Nation. The TCU bound student-athlete is so much more than all of that. Like most of our NW recruits, he is a great person- off the field by all accounts the sort of kid we want as one of our football ambassadors. If he goes to this game and plays to his ability than even more eyes will be looking at the NW for future recruits and we all win- and the effects will be felt for years and years to come. To get Ben to the game we all need to vote for him. He won round one and is leading slightly in round 2. There are a few days to go in round 2. After that, he will need our help to get to the finals. The player with the most votes at the end of this process gets the last roster spot for the game. The Under Armour Game is particularly important to the Pacific NW as it is held in Florida and there is a real bias against the West back there. This game can influence hundreds of East Coast colleges who need to see what our athletes can do! Click the picture above and scroll to Ben’s battle and Vote for him NOW! Tell your friends and teammates! Note: Several Other Top NW Recruits will lead the NW Brand into the Future and make their presence known in the biggest games of the year. We salute and support them all. Lake Oswego HS (OR) O-Linemen Dawson Jaramillo will be playing in the UA Game – he is an Oregon commit. Bothell High (WA) QB Jacob Sirmon will be playing in the UA Game- he is a UW commit. South Medford HS (OR) WR Chase Cota will be playing in the Army All American Game – he is uncommitted. Couer d’Alene HS (ID) QB Colson Yankoff will be playing in the Army All American Game- He is a UW Commit. East Valley HS (WA) Roderick Fisher will be playing in the Army All American Game – he is uncommitted. Crescent Valley (OR) Athlete Talanoa Hufanga will be playing in the Army All American Game- he is uncommitted. Highland HS (ID) Tommy Togiai Linemen from will be playing in the Army All American Game – he is uncommitted. Fife HS (WA) MJ Ale – Linemen – Will be playing the Polynesian Bowl – he is a UW Commit! Arch Bishop Murphy (WA) CB Kyler Gordon is playing in the Polynesian Bowl – he remains Uncommitted. Tigard HS – (OR) ATH Braden Lenzy is playing in the Polynesian Bowl – he is an Oregon commit. Central Catholic HS (OR) – LB Malakai Salu is playing in the Polynesian Bowl – he is uncommitted. Jesuit HS (OR) – Linemen Travis Spreen is playing in the Polynesian Bowl – he is uncommitted.